My husband and daughter both have allotments about three-quarters of a mile away and I went there this morning to find inspiration for my 25th blog post for 30 Days’ Wild. 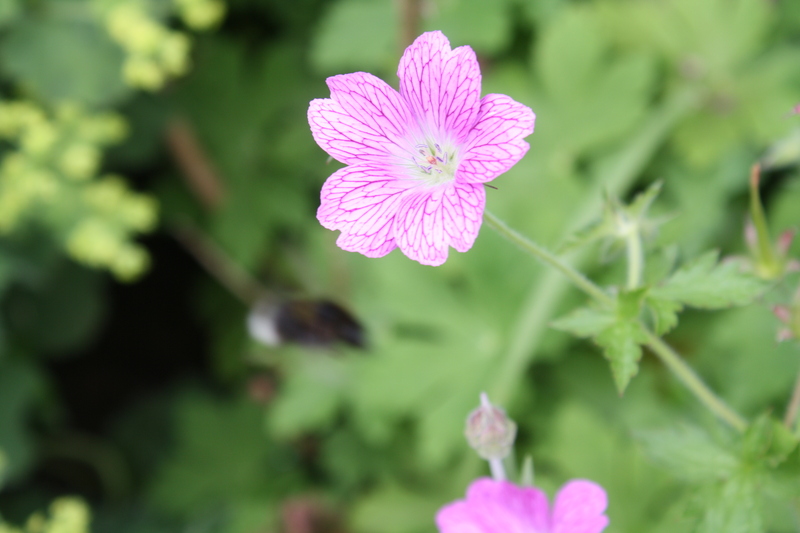 Once there, I became engrossed in watching insects on the geraniums in Vicky’s patch. And, as this week is Insect Week, I thought that would make a good topic. One particularly colourful invertebrate caught my eye. It was orange, with extensive black markings, one of which was in the shape of a triangle on its back. It was around 15mm to 20mm long, from the tip of its body to the end of its antennae. I’ve never seen one like it before. I have picked some pictures to show the markings on different parts of its body. 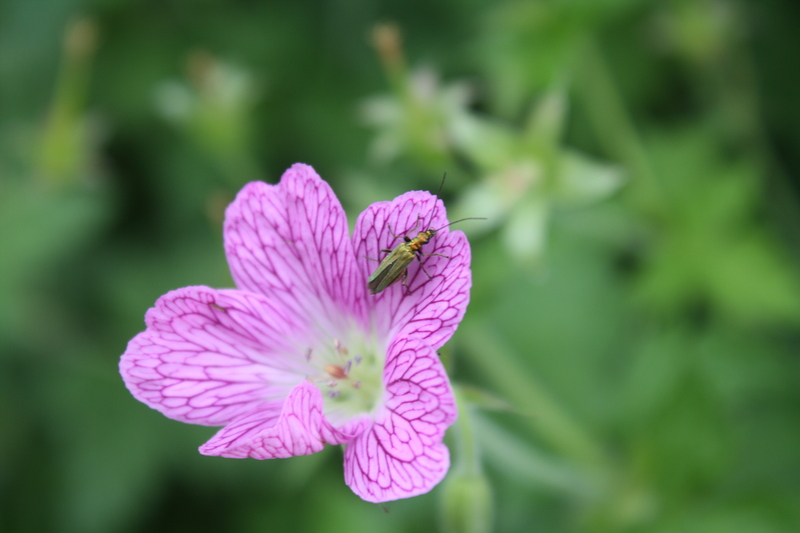 I spotted two other insects on the geraniums, and tried to get some pictures. One of them could be a female swollen thigh beetle and the other is new to me. That second one looks from my photographs to have a stripey thorax. Some bees were about as usual. Taking a closer look at the geranium flower, it looks like someone has been drawing on the inside of the petals; the lines would help guide the insects down into the centre of the flower, like a runway. Possibly a female swollen thigh beetle? The insect with a stripey thorax. The geranium with its interior design. 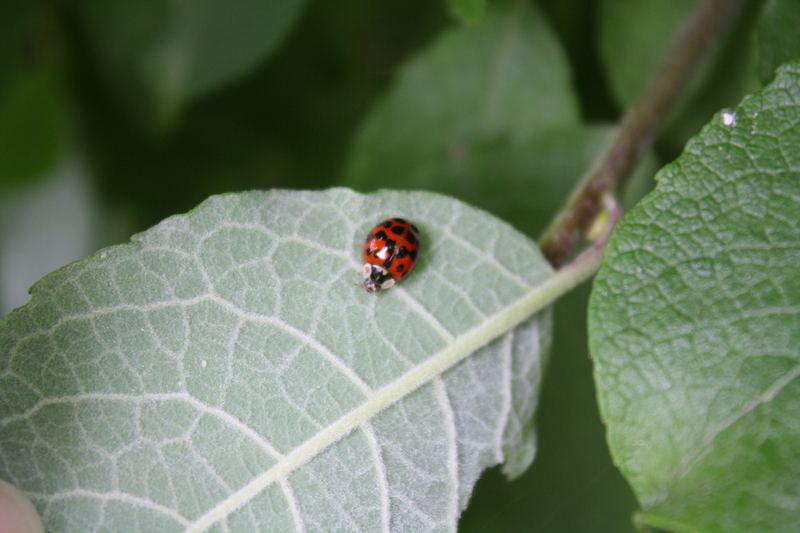 On the goat willow close by I saw a ladybird, which I think may be a harlequin species. It looks similar to one shown on my “Guide To Ladybirds Of The British Isles” fold-up card produced by the Field Studies Council, but I would say it was only about the same size as a native seven-spot ladybird. The first things I saw on reaching my husband’s allotment were two seven-spot ladybirds, which was good – I haven’t seen many ladybirds this season. I sat and looked at some small wild flowers for a time, and then realised there were two hoverflies flying just inches above the ground. I think they were different species and they seemed to search among the grass and take a sip from a wild flower or two before I lost sight of them. A little flock of goldfinches was around at first, we could hear them twittering, but only got a brief glimpse of them in flight. I think they possibly paused at Vicky’s goat willow before taking off somewhere else. Vicky has a bird feeding station on her allotment. She also has a pond which contains some tadpoles, but unfortunately, we couldn’t see them today because of the green weed over the water. She has a variety of sections on her allotment, producing fruit and vegetables, as well as what she calls the “ornamental section” where there are lots of colourful flowers. Part of the “ornamental section” can be seen above in my featured image.The whole area is attractive to wildlife. Chaffinches were singing enthusiastically and starlings were chattering among themselves. Blackbirds are common visitors to the allotments. I usually find the allotments a good place to wind down; it’s getting back to basics, growing things, and that has to be close to nature. 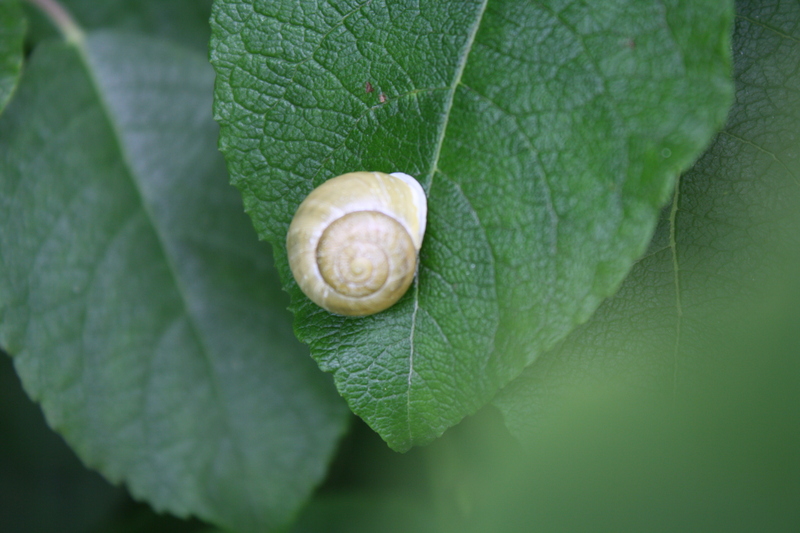 And finally, the snail on the goat willow.